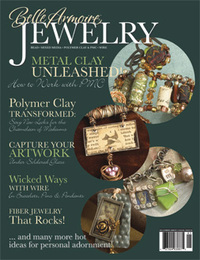 I've had a few questions from my dear readers inquiring about mica. Rather than give you my amateur explaination, I will guide you to the semi-professionals at wikipedia. I will tell you what my Dad told me about it when I was a little girl...and I still think this is the coolest thing...mica is a rock! Yes, it's a shiny rock that has conveniently formed in layers for us artsy types to separate and use in all manner of projects. The real question is, where can we find it??? Here are a few links: US ArtQuest has lots of embellishments and supplies that you can't live without, including the ever-elusive mica. Volcano Arts also carries mica along with all kinds of tools and gadgetry to add to your tool pile (see post below). 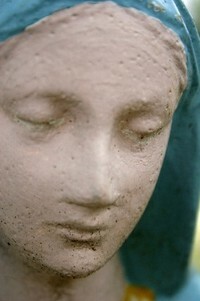 This info should be enough to help you start emptying that rainy day art fund! Look at this pile! 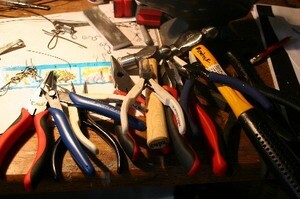 Do I really need this many tools for making jewelry? Um...yeah. And I have even more...much more (don't tell WW). These are just my faves. 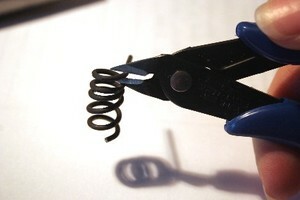 But, all have been eclipsed today by the glorious Mazbot bailing plier. Swoon! I tell you, this tool is so great, I actually kissed it! 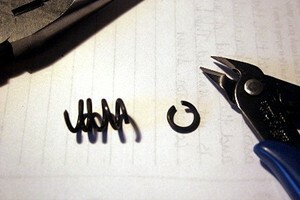 Yes, I know it's weird but, if you've ever made jump rings by hand, you'll know what I'm talking about. 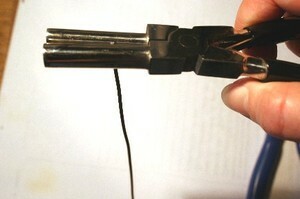 This plier is used in place of a mandrel and turning jump rings with this baby is a piece of cake. I know there are lots of other fancy jump ring making tools on the market but, if you're going to make them the good old-fashioned way, bailing pliers are the way to go. I couldn't find a link for the Mazbot brand but I did find another link for you if you're interested in swooning or slobbering over your own pair. Just in case you've never twisted your own jump rings, I thought I'd post a little jump ring tutorial for your viewing pleasure, using my new, spectacular tool. I did my best with the pics but it's not easy trying to work with my right hand and take a photo with my left. I'm using pretty heavy, 18 gauge steel wire for these jump rings. I've started using these cheap flush cutters and they work great. I get a nice, flat cut, even on the heavy gauges. When they wear out, I'll run to the craft store and get myself a brand new pair! 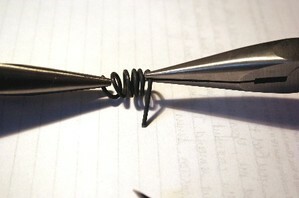 Before you start bending, trim both ends of your wire flat. 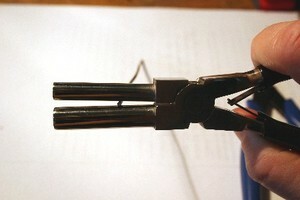 This is where the amazing Mazbot (or other brand) pliers come in handy. 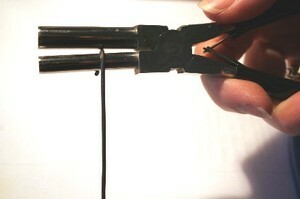 Place your wire inside the pliers with the wire end flush with the plier barrels. Now, hold the wire in your left hand and start to turn the pliers, keeping the wire tight up against the barrel with your thumb. I left my thumb out of the pics so you can see better. 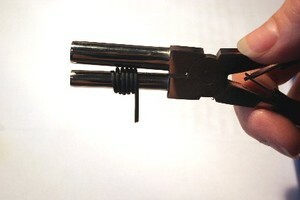 These pliers have two different size barrels, one 9mm and one 7mm, so you can make two different size jump rings. I'm using the 7mm. 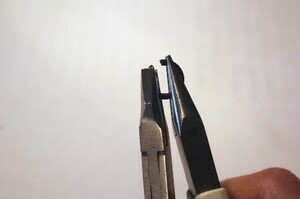 There is also a 4mm/5mm size plier. 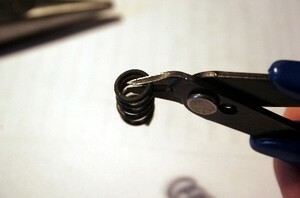 Continue to turn the pliers while holding the wire firmly with your thumb. You'll have to open and close the jaws of the pliers as you turn them around. Almost done turning... Now, you can slide the wire off the pliers and you'll have a nice, neat coil. Time to pull your nice coil apart. 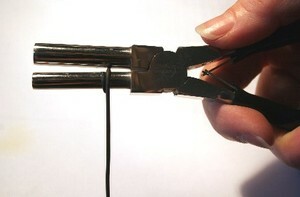 Using chain nose pliers on both ends, gently pull the coil apart slightly. Using the cheapie flush cutters, cut off the tail of the coil. 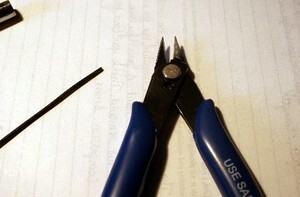 Make sure your cutters have the flat side (the back side) facing the coil and not the tail. Ok, this picture isn't the greatest but...now you'll cut your first ring. Come in with the cutters from the side, keeping the flat (back) edge of the cutters away from the cut you just made. 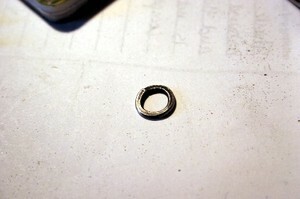 The back edge of the cutters is where you get the flush cut so, on your jump ring, you want two flat edges to match up. See? Line up the back edge of the cutters with the edge of the coil above and snip. You'll get more power from your cutters if you cut toward the back of the blade so try to scoot your pliers right in between the coils. Congratulations! You have your first jump ring! Continue cutting the rest of your rings, making sure you flip your pliers so you're getting a flat edge on both sides of your rings. 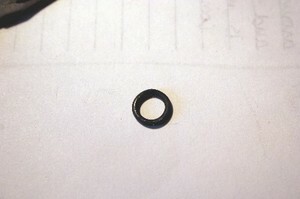 You'll have to trim a tiny bit off the coil after each ring is released in order to keep that flat edge. Now, place your two pair of chain nose pliers on either side of the ring. 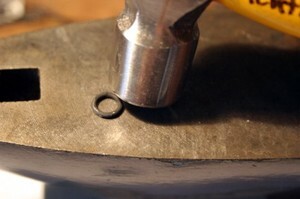 Wiggle the ring back and forth, grinding the cut surfaces against each other and closing the ring. If you did a good job cutting, the edges should be nice and flush against each other and your ring should be nice and round. Next step is to give it a whack with the hammer. This is really fun as long as no fingers are touching the anvil. You can flatten your rings a lot or a little...it's up to you which look you want. Hammering hardens the metal and gives you a nice stiff ring that won't open easily. 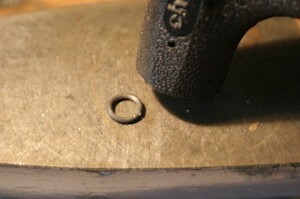 If you don't want your rings flattened at all, use a rubber mallet, rawhide mallet or nylon hammer. I use this nifty, small, deadblow hammer. It hardens the metal without marring it. I sand my pieces with a foam sanding block, fine grade, then go over them with a buffing stick. 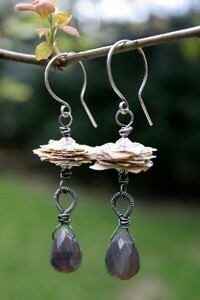 The buffing sticks are for manicures but they work great on steel wire jewelry. So, you're done! You've made one jump ring. Wasn't that fun? 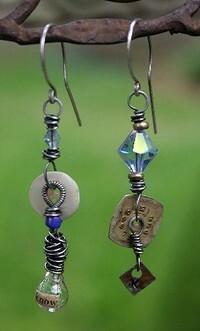 Believe it or not, I actually took my jewelry tools with me camping over spring break and finished several pair of earrings. I start to feel anxious when I go too long without creating so Wife Whisperer encourages me to make stuff...wherever, whenever. There were a few gorgeous, sunny days...not too hot...so I drug my gear out to the picnic table for a little stress relief. What could be stressful in our idyllic, outdoor home you ask? Living in a camper for a week or so with WW, 2 almost-grown young men and a frisky, muddy doggie has it's ups and downs. There was a very noisy all night thunderstorm during our stay (WW slept through...of course!). 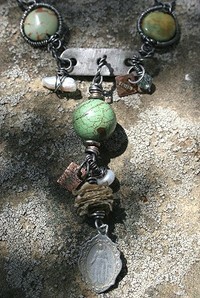 But, in general, a great time was had by the crew and I turned out a few pieces of jewelry to offer you all. Check out the details here. Have you got your hands on this great read yet? 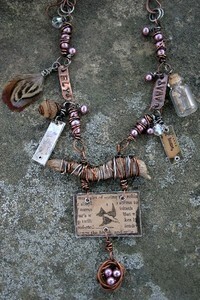 The sub-title reads "ideas + projects to SPARK YOUR CREATIVITY" and, wow...Suze and friends do a great job of that! This isn't your typical how-to book. Of course, there are terrific projects in the book and the graphics are just incredible but my favorite thing is that many of the artists that wrote for the book go into the mysteries of inspiration. They tell their own secrets for what inspires them creatively and also divulge great tips on how you can be inspired as well. 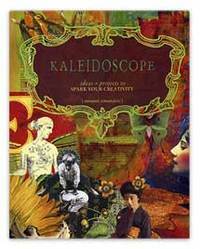 Amongst the talented artists published in this book are some of my own artsy friends: Susan Tuttle, Pilar Pollock, Sylvia Luna, Lou McCulloch, Melissa McCobb Hubbell, and the fab Mary Haldeman. Congratulations to you ladies! I've been camping for the last five days at the beautiful Frio River, on the western edge of the Texas Hill Country. The water in the Frio is clear and cold which is great when it's 90 degrees outside but not so good when it's only 40 or so-like the weather we had for half our trip! Regardless, those cloudy days were great for picture taking. Wife Whisperer demonstrated his expertise in wife handling by pulling off at St. Louis Cemetery in Castroville for a photo op...without even being asked! As you can see from the pics, the trip wasn't bad at all. There were several sunny days (even if it wasn't 90 degrees! 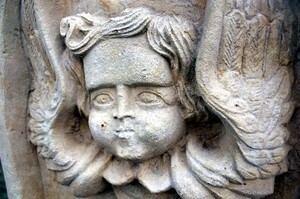 ), fresh air and a fabulous cherry pie from the local bakery. What more could you ask for? I've been looking to use these periwinkle/silver, top-drilled, freshwater pearls in a piece of jewelry and I found the opportunity when I transfered this image to the back of an antique crystal. 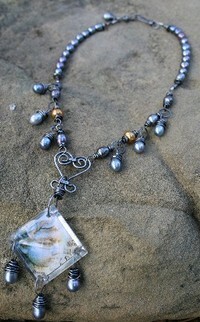 The color of the pearls perfectly picks up the blue in the transfer. 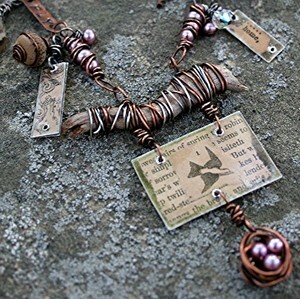 The shape of the pearls make them perfect for a wrapped dangle. This is the third of 16 of these antique chandelier crystals I was lucky enough to stumble onto at a glass show. The square shape and pyramid top makes them ideal for transfering images to. 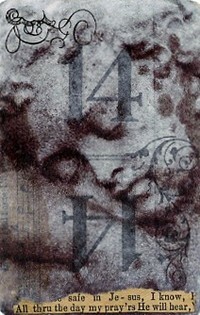 Please email me if you are interested in purchasing this piece. Click here for price, details and other available pieces. 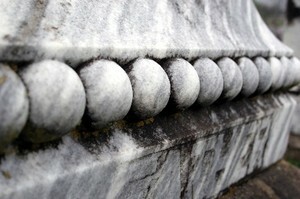 Here's the original photo I took on a beautiful, sunny day at Black Jack Cemetery near Huntsville, Texas. Isn't it sweet? My fingers are sore and my wrists are aching but I'm happy to have finished another piece to offer up for sale. 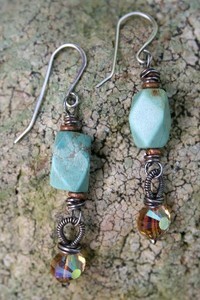 For this one, I used wrapped turquoise coin beads, twisted wire rings and vintage chain. 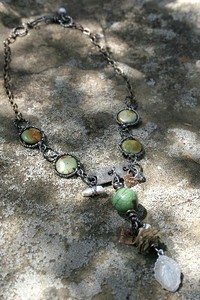 The centerpiece of this necklace is a found metal object from which dangles a large, round, turquoise focal bead hung with a few charms and a vintage religious medal. 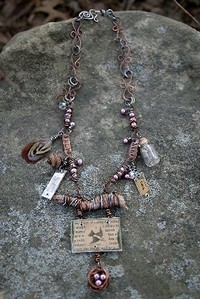 Between the medal and the focal bead, I added coated, torn pieces from an antique Bible. Some of the words contained in this piece are: precious, desire, Jesus Christ, obedience, grace, revelation, spiritual sacrifice, prayer, heaven, angels, glory, spirit and salvation. All that in a tiny dangle! Please click here for details, price and other pieces available. I'm having fun with some transfers I did a long time ago and forgot I had. In preparation for a class with my friend DJ Pettitt, I had made quite a few transfers using t-shirt transfer paper onto sandwich paper. After the class, they disappeared into the black hole that is my studio but I rediscovered them the other day while making atcs. 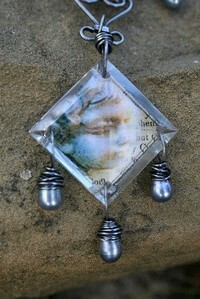 The sandwich paper is thin and somewhat transparent and makes a great overlay. 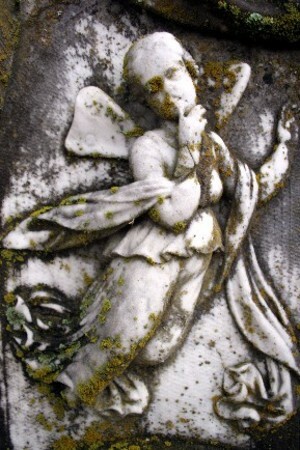 The top image is a cemetery photo I took at Glenwood Cemetery with the old Pentax. 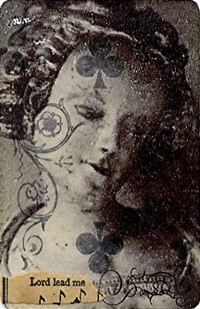 The bottom image is from a French, antique postcard.